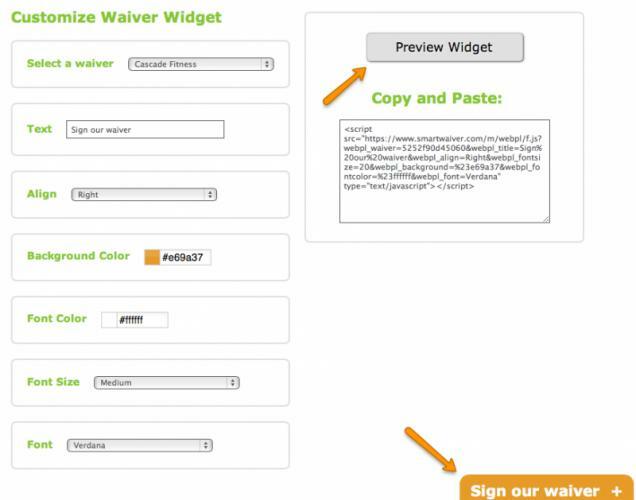 Adding the Smartwaiver Waiver Widget to your site allows participants to sign your smart waiver without ever leaving your website. 2. Select the waiver to which you would like to add the widget. If you have a Waiver Index Page for your waivers, select Waiver Index Page from the dropdown. 3. Customize the text, alignment, background color and font color and style. 4. Click on the Preview Widget button. The widget, as it will appear on your website, is displayed at the bottom of the screen. If all looks good, copy the code in the box and send to your web developer to place in your website code. 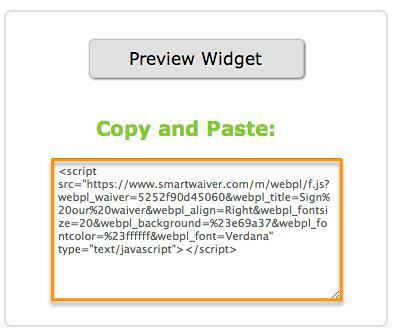 Once the code is embedded on the bottom of your site, participants can click on the widget, fill out and then sign your smart waiver without navigating away from your website.